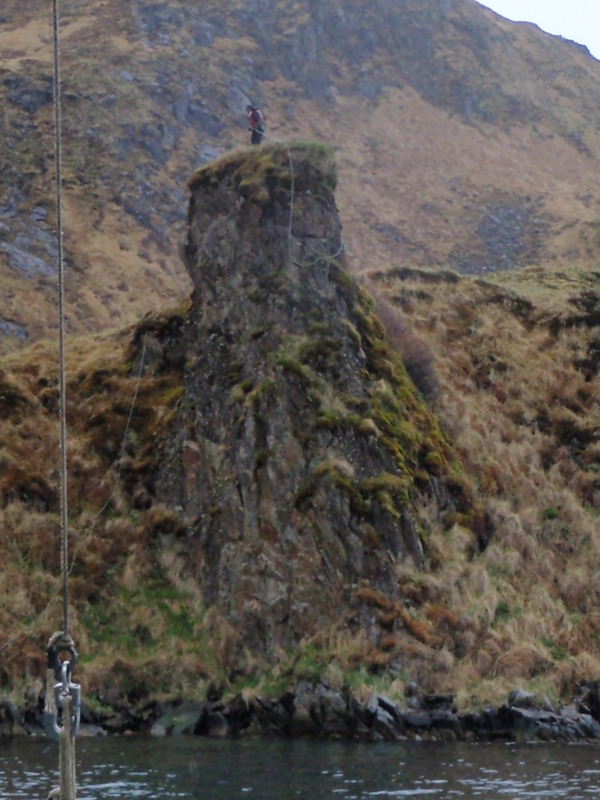 The problem, in the deep and narrow confines of Naginak Bay on Unalaska Island in the Aelutians, was that the anchors kept slipping. A successful coring operation requires that the coring platform stays still and does not drift off station. While high-tech solutions such as dynamic positioning can be used on larger and more expensively equipped vessels, the go-to solution for station keeping is to set three anchors such that the coring platform comes to rest firmly between them. If not set correctly the anchors may slip, the boat may drift, and coring becomes impossible. This was the problem faced by WHOI scientists Dr. Jeff Donnelly, Dr. Andrea Hawkes, and tech Richard Sullivan in Naginak during their 2011 expedition; the third anchor kept slipping. After numerous failed attempts a new plan was devised… lassoing a pinnacle. Once the stationkeeping problem was resolved (and after Richard got his rowing and rock climbing work out for the day) the team managed to recover numerous 9m long cores from the base of the bay. These cores contained a high resolution storm record that can help us better understand how frequently high energy storm events in the North Pacific have occurred over the past several thousand years.